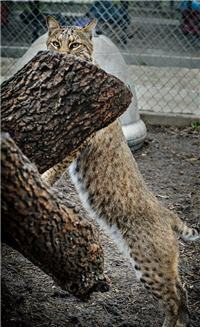 One of our volunteers that also volunteers with a dog rescue, contacted us about a bobcat she had seen during one of her rescues. Isaac was being kept in a 2 X 3 wire dog cage for the past 2 years when she called us about taking him. 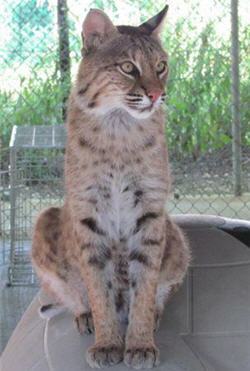 In the tiny wire cage, Isaac was sitting on top of at least 4 inches of dried feces and decaying food parts and bones. There were two old plastic coffee cans that may have held water for him but both were empty and covered in dust and debris. We first moved him from the old cage to another cage that we could keep inside for a couple of days, so that we could keep an eye on his health. Needless to say Isaac was not a very friendly cat and would stay towards the back of the cage hissing and growling at us when we tried to care for him. We had hoped that because of this behavior we might be able to send him to a rehabber so that he could be set free. When the rehabber came to see him she was unsure that he would be able to survive in the wild. We moved him to an outside enclosure to get a better look at his mannerisms. 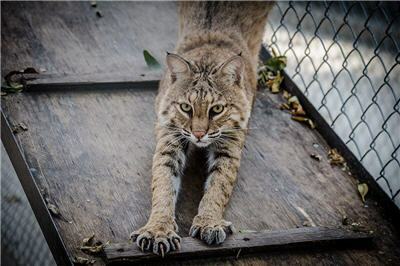 While in his new enclosure we learned that Isaac was not the kind of bobcat that would run from people, but he would actually charge anyone that would get to close to the fence. This action led us to believe that if he was in the wild and a human got to close to him, he would attack. Isaac had learned that not only were humans bad, but also not to be afraid of them. 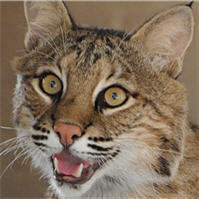 All other bobcats could pay for the actions of one if he had decided to charge a human. Isaac has now been introduced to Lydia and seems to be very happy with his new surroundings and roommate. Although it would have been great to let Isaac free as he should be, we are very happy that he has come to accept us and his new home.